SKI IN SKI OUT ACCESS: From this luxury residence to the ski slope, it’s only 5 steps! THE PROPERTY: If you have stayed in this residence before, you know why you keep coming back! If you have not, then you will be very pleased with the direct condo to slope experience that this luxury property offers. Superb convenience, lovely decor, on site outdoor heated pool, hot tubs and views! The kitchen includes stone tile countertops and top of the line appliances. Each bedroom has its own bath. And the living room has comfortable furnishings, hardwood floors, widescreen TV with DVD player, and a huge moss covered rock fireplace that lights with the flick of a switch. Hi - Thanks for considering this awesome property, just 4 steps to the ski slope leading to the Bachelor Gulch ski Express! CONCIERGE SERVICES: Your stay includes complimentary concierge services - let us take care of the details including everything else: ground transportation, lift tickets, ski rentals, grocery shopping, spa and restaurant reservations and more! Looking forward to helping you plan the best trip ever! PROFESSIONALLY MANAGED: Bear Paw A10 is managed by Accommodations Vail, LLC. Our office is located in Avon, just minutes from the entrance to the Beaver Creek/Bachelor Gulch resort and a short drive from Vail. We are staffed by highly knowledgeable locals who know the area in depth and will utilize our insight and expertise in every aspect of your trip planning. As a family, with young children who can all ski on a wide open ski run, this is the most convenient location! This slope level condo offers direct access to the winter slopes via the ski locker room door, or the living room door of the condo. Bear Paw lodge has the ambiance of a cozy, luxurious residential mountain lodge. As such, you will find it to be very accommodating, private and convenient. Full concierge services, housekeeping and maintenace provided to ensure that you have a wonderful stay. toilet, tub, shower, Jetted tub for a luxurious soak! This is by far, the best property and the best management services in Colorado. The best location for skiing with all amenities. I had a wonderful time during my stay this past weekend.I got to see some awesome wildlife like black bear with her cubes,beaver,squirrels, deers and a falcon. The place was fantastic great view of the rockies and if it was winter time, it would of been awesome for skiing as well. Good amenities such as parking,cable,elevator, hot tub and pool. I highly recommended this place for a weekend or romantic getaway, vacation either summer or winter, anniversaries and honeymoon. The place is so relaxing that makes you forget about your troubles. Overall this place is great if you like outdoors , skiing(winter only) wildlife or want to get away from a big city, come on by and check it out. I promise you wont be disappointed. We decided on this location because we thought it could accomidate our large family ski get-away. We were not disappointed! The location was perfect! Most of us aren't great skiers. The building is located on a gentle blue slope so everyone felt comfortable skiing in and out. The views are AMAZING! The free shuttle service in between Bachelor Gulch and Beaver Creek (a few miles away) made moving the tribe easy. Just a simple phone call and a small bus picked us up for dining, shopping, ice skating, etc. The property management company was available, but not overbearing. We are coming back! We stayed 3 nights in February 2015 and it was just awesome. Very attentive staff at Accommodations Vail. We had a wonderful time definitely coming back to this area. Very awesome area to vacation, one of the best ski locations and helpful staff. 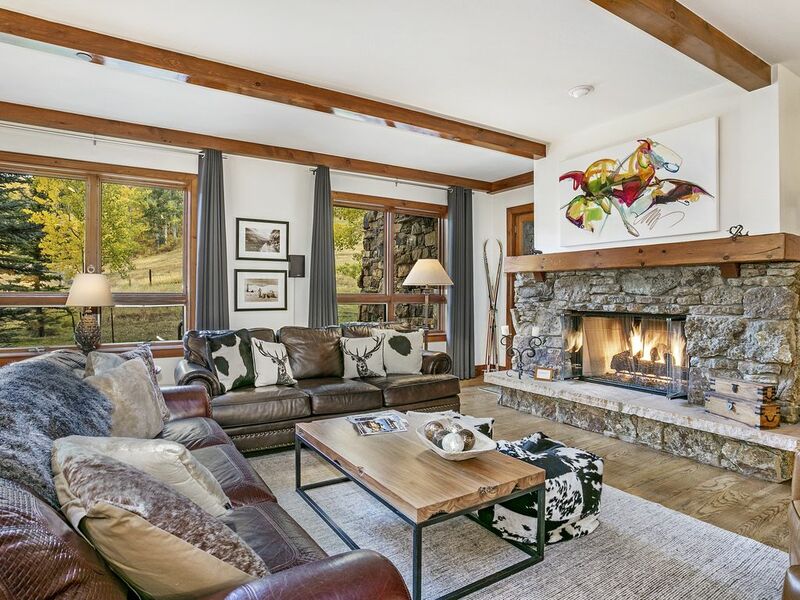 I visit bachelor gulch quite often and this condo exceeded my expectations. The living areas are very large and the walk out area is very private. Lots of room to sit and play games and gather as a family. I have stayed at this unit in Bear Paw for the past 10 years and will not go anywhere else. You can not beat this place for the true ski in, ski out that it provides. The home is beautifully furnished and has all the amenities that you need. We have had the chance to bring our children when they were young and when they have all grown up. Once you get here you no longer need a vehicle as shuttles take you wherever you want to go. The people at Accommodations Vail provide everything that you need. They have always done the shopping for us so when you arrive all you have to do is relax and enjoy yourself. It truly does not get any better than this. Your stay includes housekeeping on stays of 5 nights or more and complimentary access to the Ritz pool and hot tubs, and guest access to the private spa! Once we confirm your stay, then we will proceed to assist you with planning your vacation, and to make all of the arrangements for you. Our complimentary concierge services include: ground transportation; activities reservations; luggage delivery; grocery delivery; and dinner reservations …allow us to handle the details!